How do you make "The Queen" look great when it's so cold you can't feel your fingers? Obviously, you have to warm things up a bit. Rachel Alexandra, in all of her maternal glory, still has a huge following. Stonestreet farm was kind enough to ask Wendy and me to grab a few photos for the fans. Only problem was that it was 25 degrees. With light snow. And a wind chill of about 10 degrees. We used 2 lights for this shot. The front light, (or key), does all of the heavy lifting, illuminating her trademark broken blaze. The back light, (also called a rim light or kicker), rims Rachel softly enough to set her apart from the background. We used 1/4 cut CTO (orange) gels on both lights to warm her up. Did I mention it was a cold and blustery day in the hundred acre wood? Production shots by Wendy Wooley. 1/4 cut CTO gels on lights. We love our new lights! Our last wedding justified an upgrade to the new Elinchrom Quadras. We love'em. Recycle time and battery life... amazing! They did notice the cold, but kept marching on. And we can BOTH fire our cameras using the same lights at the reception! So Rachel got the royal treatment, a nicely lit portrait shot using our wedding gear. I'm firing the lights with Pocket Wizards, just like in some of our previous blog posts. Light from a flash wants to fly around everywhere. It's indiscriminate. So I put a SNOOT on the back light to give it some direction, and gave it a little less power than the key light. I just want to put a subtle highlight to Rachel's ears and neck from behind, I don't want to nuke the place. A snoot is nothing more than a tube that directs light in a narrow beam. 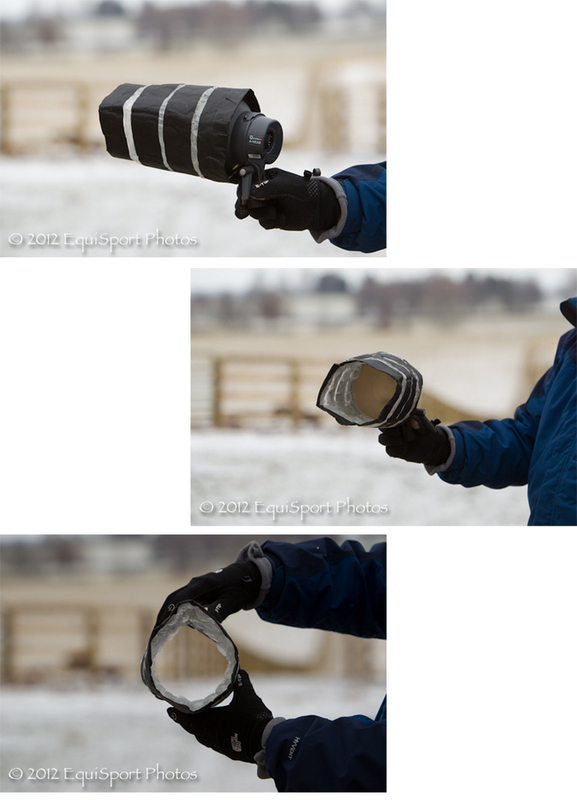 You can make a snoot for your flash with most anything... like bubble wrap and gaffer tape! Just roll it up, wrap it up with tape, stick it on your light and fire. Now you have control of where the light goes. Out in the paddock, things started to get really cool! Did I mention that good gloves are essential to your kit? I go to Aperture Priority here. Really the only thing I need to control is the depth of filed. F/4 is perfect with a long lens. I don't care what the shutter speed is, as long as it's "fast enough". Rachel leads Hot Dixie Chick. Photo: Aperture Priority, f/4 @ ISO 400 gave 1/800th, 0EV, 300mm. Wendy and I both shoot this scene in CLOUDY WHITE BALANCE to keep the warmth going. Cloudy is about 6000 on the temp scale, where Auto WB would have given up about 5000 or so. We're shooting in RAW, so we have lots of latitude when we crunch it through Lightroom, but Cloudy WB puts us in the ballpark. Rachel. Photo: Aperture Priority, f/4 @ ISO 640 gave 1/1000th, +1/3 EV, 300mm. The farm asked for some paddock shots showing Rachel in all of her regalness. 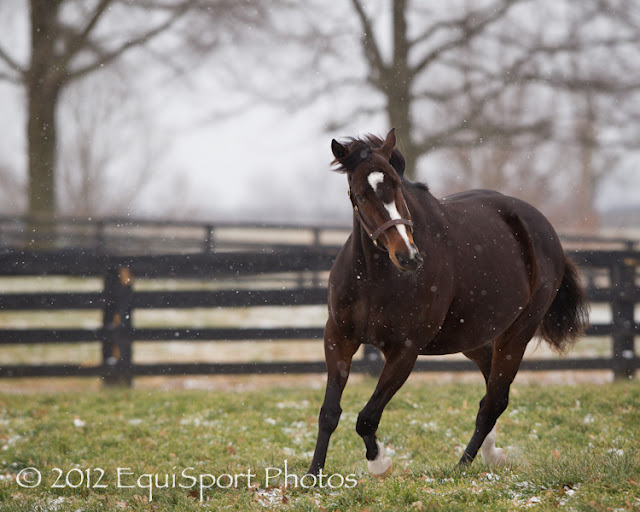 She is in foal to Curlin, and expecting a colt around February 1st. She looks REALLY good! Wendy said she thought Rachel might have potential in the dressage ring. We'll keep you posted if she makes a career move. 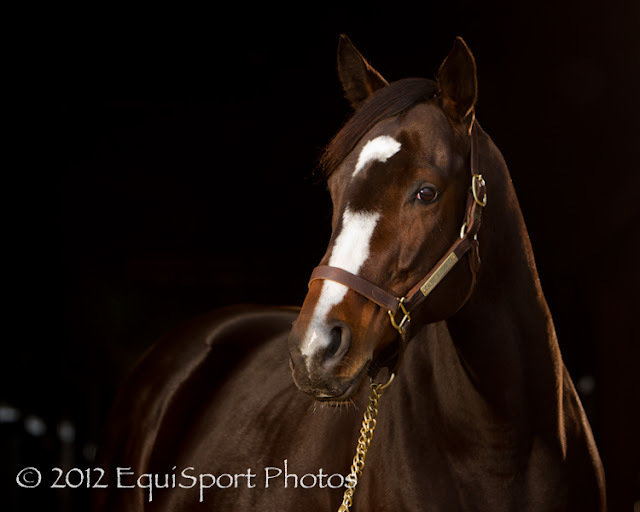 Rachel Alexandra, dressage pony! Photo: Wendy Wooley/Aperture Priority, f/4 @ ISO 400 gave 1/1000th, +2/3 EV, 50mm. One thing the snow (or rain) will do is "take your focus". The camera's Auto-Focus wants to grab onto anything that's moving when shooting in AI Servo. It makes for some nice artsy-fartsy type shots... but you don't want them ALL that way. 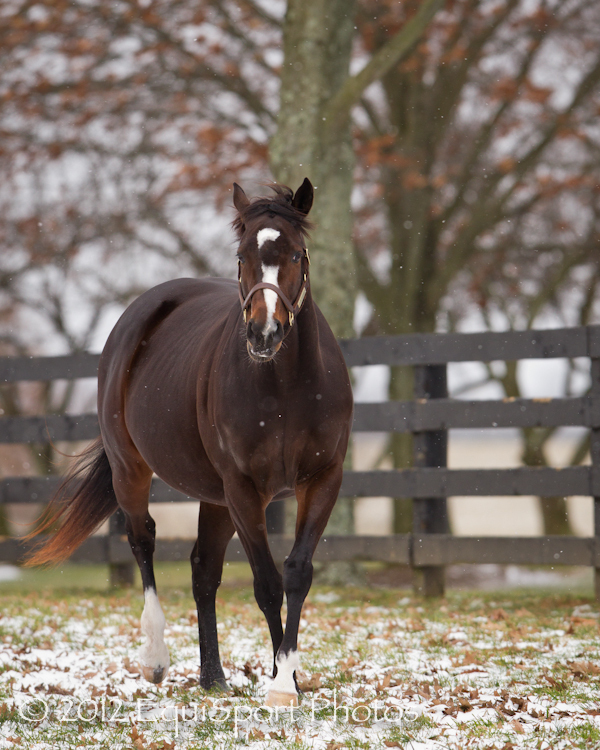 Pick a point of big contrast, like Rachel's blaze or halter buckle, to keep the AF on track. "Abstract Rachel". Photo: Aperture Priority, f/4 @ ISO 640 gave 1/800th, +1/3 EV, 300mm. A little PLUS EXPOSURE COMPENSATION keeps things bright. Just like Clorox. Remember to add a little exposure value if you need to keep the whites white. We talked about the use of "plus" and "minus" EV in a previous post. Rachel and HDC's neck. Photo: Aperture Priority, f/4.5 @ ISO 640 gave 1/800th, +1/3 EV, 300mm. 1) Get the light off of the camera. That nice new hot shoe mounted speedlight is NOT going to flatter your subject if you mount it on your camera (unless you happen to like the look of driver's license pictures). Use a trigger to get it off to the side, and give your light some direction. 2) Shoot off camera flash with your camera set to MANUAL mode. Just do it. Always. You need to control both the SHUTTER speed and the APERTURE. Check out my camera settings in the first picture above. When I looked at the EXPOSURE METER through the camera's viewfinder, I was reading between 2 and 3 stops UNDEREXPOSED! I want to keep the background dark, and I know the flash will light the subject for me. 3) Keep your Shutter Speed at 1/250th or less. The camera and lights don't talk to each other too fast in this type of setup. You can't go to 1/500 because the camera's sensor can't pick up the flash burst that fast. A fast shutter speed, like 1/250th, will help keep the background dark. A slower shutter speed, like 1/60th (2 full stops slower than 1/250th), will let more background light reach the sensor, and help the background look richer and deeper. 4) The flash actually fires faster than 1/1000 of a second. So if it's dark enough, you can hand hold your camera at 1/60th easy, cause the flash will freeze the action. Think about that... no matter what your shutter is set on, the flash fires at 1/1000. I've taken razor sharp wedding photos in relatively dark conditions, hand held, at 1/30! Be sure to leave a comment if you have any questions or great ideas! 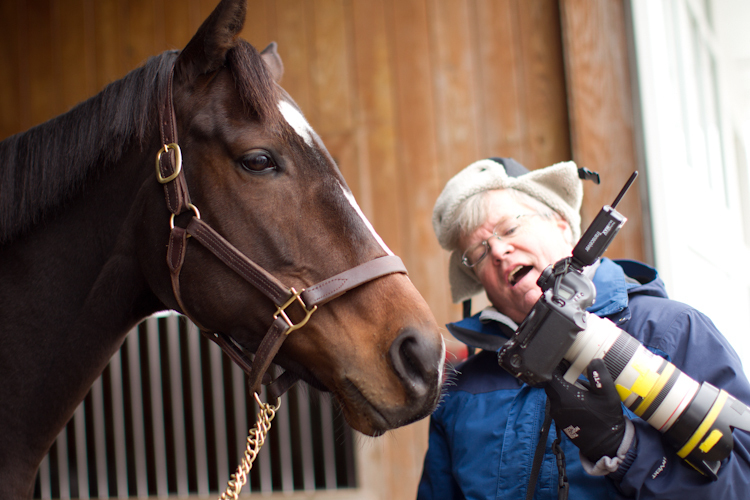 That's about it for now..
We are looking for a few more Camera Happy Participants for our Spring Equine Photography Workshop, May 1-3! We will be sharing our "Tricks of the Trade" with those who wish to take their equine photography to the next level, for either personal enjoyment or professional advancement. And... we will be visiting some great locations in the Heart of Horse Country! We already have several people signed up. Space in the workshop is limited to 9 or so! Check out the Capture The Light website for all of the topics and details. 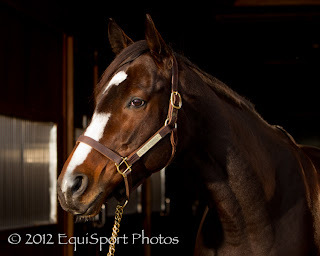 There are few bigger fans of Rachel Alexandra than me, and I think she was superior to Zenyatta, but "The Queen" is definitely the latter's nickname, and it just seems "off" to address Rachel Alexandra in such a way. Thanks for the comment Ed!.... but, Rachel was crowned HOY first (not that the Z horse wasn't deserving as well). Once the Queen, always the Queen! Thank you for the lovely photos! 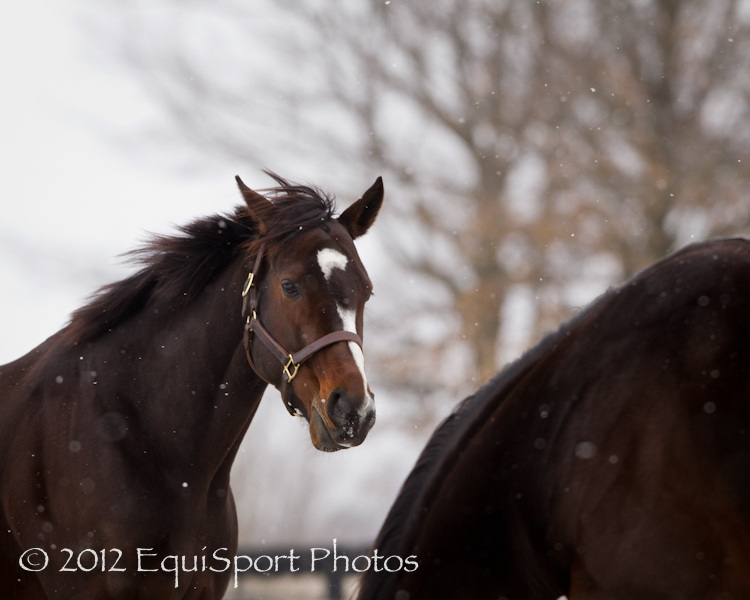 No matter what you call her, RA is beautiful. She looks healthy and happy. 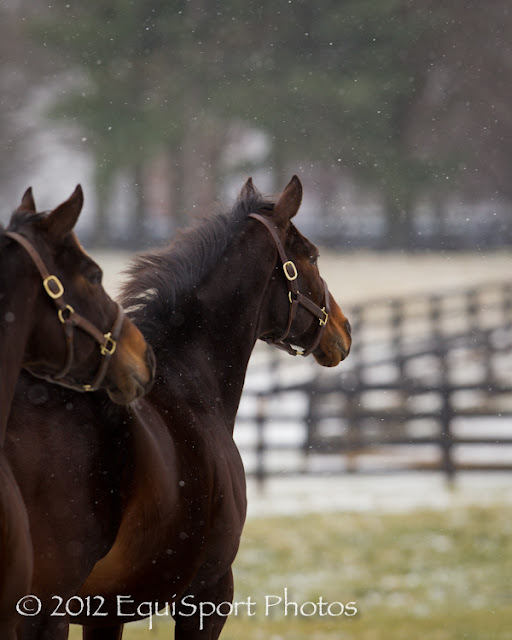 Here's to a healthy, happy foal.